Many churches are confirming their budgets now for the year ahead, using the term “faith budget.” In my congregation that means the leaders include a percentage of projected income beyond pledges, to allow for loose-plate offerings, new givers, or second-mile giving. In most situations, it’s a realistic and encouraging thing to do. “Faith-based budgeting” is the umbrella under which this and other good practices fall. When I hear the phrase, I think of lessons shared by two people. The first one is Mark L. Vincent, North American stewardship consultant and CEO of Design Group International, an organizational development company for ministries and nonprofits. 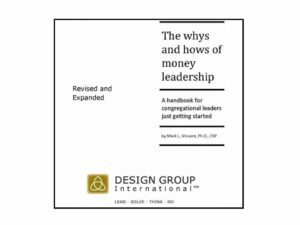 His The Whys and Hows of Money Leadership is an outstanding resource for faith-based budgeting practices. Most churches advise families to give, save, provide, and consume – in that order, Vincent says. Likewise, he shows how a congregation’s priorities for use of income can and should be first fruits, then staffing, then facilities and programs – in that order. “First fruits” refers to all money the church gives away, over which it has no control. “Staffing” includes all salaries and office-related expenses. “Facilities and programs” covers expenses a congregation has in the normal course of running its programs, apart from special funds and projects. It makes sense that a church would practice what it preaches when it comes to money: putting first things first! The Whys and Hows of Money Leadership shows us how to actually do that. It also offers some great chapters on the relationship between money and faith, a financial health checklist, Narrative Spending Plan guidelines, and more. This would be a great curriculum for your financial and stewardship leaders to study for their service in the New Year!